I visited the new WGBH this week. The office part of the complex is just starting to fill up, with many departments yet to move. The studio, master control, and public areas will not open until September. The official turning on of the LED outside walls will happen on September 17. There will be “slow-moving” excerpts from WGBH shows. This is the deal with the Mass. Turnpike, which is afraid that people will become so interested in the video that they will cause an accident. After 7:00 PM at night, the station walls will feature images of the sky with stars blinking off and on. It is assumed, as the drivers get use to looking up at the video, that the station will begin to display even more and more excerpts. Stay tuned for upcoming grand opening events at 1 Guest Street. 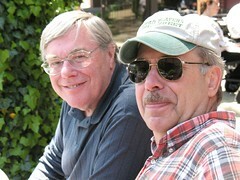 Photo, above: Fred Barzyk and David Atwood, 5/23/2007. By Jay Collier.